I want to give a BIG thank you to Lionel and 3RD Rail/GGD for working out a solution to keeping these products available to us consumers!!! Now we have to make sure Scott gets enough orders to make it viable,like he says it's a business!! Out of the various mini commanders, which one, if only 1 could be made, would be the one that has the most universal usage? My other choice is the Mini Commander ACC. It appears from my examination of both the ACC and HC versions that the only difference is a more robust triac on the HC version, they're the same PCB and code from all appearances. That's a modification that folks could do "in the field" if they needed the HC version, so stocking the MC-ACC would appear to be the best path. The MC-ACC is the key to doing a lot of TMCC controlled accessories and rolling stock, so it rates high on my list. So, my vote would be for these two. Thanks for listening, and a BIG Thank You for picking up the ERR product line! While I can't speak for the Mini Commander II, I will second the Mini Commander ACC. Thanks John for nominating these. I think the CC Lite is also a good choice for the small to medium sized motorized units??? Maybe I'm missing something, but I don't understand Scott's "better order now or we'll look at you funny when you try to order again" comment (that's only an approximate quote). Huh? "No deposit required, but you better buy when the boards arrive, or we will look at you funny when you try to order again." Which I interpret to mean he's letting you order without any down payment, BUT he expects you to pay for your order when it arrives. Which Scott explained perfectly in his response in this post. No further interpretation required, he spelled it out quite clearly there! So are they doing a BTO? Seems kind of strange for the product involved. In the microchip/PCB/board business, the more you order(from the manufacturer), the better price discount you get. Of course, you don't want to have to much of this type of inventory laying around. Don't overthink my comment. I'm very glad that they have stepped up to make the boards available. The difference in parts costs from 100 units to 1000 units isn't as much as you might imagine. Also, when you're getting boards assembled, once you do a couple hundred, the difference between the assembly cost between 100-200 and 1000 is also not that great. Yes, there are some savings, but having hundreds of units in stock for a long time will eat up that savings in a heartbeat! I think Scott is being pretty smart in gauging the interest and proceeding carefully with his ERR project. I've gotten quotes for boards quantities from 500 up to 2000, and the difference in prices didn't justify sitting on inventory for months to place a larger order, on the order of 10% savings per board. Scott's in a unique position as he actually uses some of the ERR products himself, so he certainly has a vested interest in the line continuing. OTOH, the additional ERR products that don't get used in the 3rd Rail product line will have to stand on their own as far as volume and profit margin, so proceeding with some caution makes a lot of sense. One other point that I was going to mention in the product line. I'm a bit surprised that the DC Commander is all that popular, considering that the Cruise Commander offers a major step-up in performance. I understand the AC Commander being included, it's a unique product that doesn't have an alternative. Do the sales of the DC Commander vs. the Cruise Commander really justify keeping that in the product line? Just curious, I've only used a couple of these over the years, most folks opt for the Cruise Commander. For me if only one version of the mini's can be made I would suggest the Mini II. 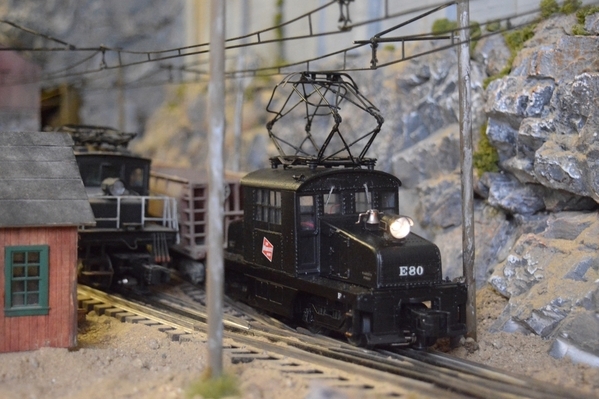 It is by far the most versatile for most of the "S" gauge engines. The DC commander like the AC commander is a price point for some and also if your not running up and down grades the cruise is not really that important to someone that basically has a flat layout. Yes the cruise is a better product but some don't need it. and some the price difference is enough to let them do the upgrade and purchase the railsounds also due to limited cash available for other things. I don't remember the exact difference but I believe it was like $50.00 which might not be a lot to you, but is to some. And if you can do without it or don't need it, why buy it. There must be enough that do use it, to make it a decision to keep it. I couldn't agree with you more GRJ, I was thinking the same thing, the benefits or cruise is well worth the price but maybe it has to do with the ERR Softset technology? Maybe that was an ERR technology and it can't be replicated without licensing? Please correct me if I am wrong. You are wayyyyyy more of an expert than I am in that department. Given the die is cast and all that about 20-20 hindsight this points out how this would have worked out better for all had the transfer to Scott been made before the announcement. He could have acquired ERR's remaining inventory, 6 months worth we are told, and been up and running as soon as his staff was up to speed on custom programming the boards. He would have a gauge on what products are selling or not and then order as needed. I use the DC commander due to I like my trains to pull the hills slower. I have a 7 inch difference but it's over 25 feet of track and I only run short trains of 1 powered engine, 1 or more dummy engines and 15 scale cars. Also I like the ability to add the DC commander or dummy controller to a engine and then at a later date add the RS. I have many dummy engines with sound and run them with engines that have no room for the RS unit. I still need 6 or more DC commanders and 2 AC commanders and 6 dummy units plus RS for them. I plan to purchase these TMCC products over the need few years. I have the money to purchase any new engine from any of the manufactures that I want But I have more fun up dating my old engines and the used engines that I purchase to TMCC. Just catching up..THIS IS WONDERFUL NEWS!!!!!!! Postwar, MPC, LTI Standard O, Postwar Celebration Series, Conventional Classics, All the way!!! IIRC, Lionel said that six months worth of orders were placed, not that they had six months worth of inventory. I'll concede that point but I doubt there would have been a run and many of their dealers would likely have inventory for a while including the Mini Commanders and Cruise Lites. The attack of the hoarders would have been minimal. As a very small ERR dealer, but one who has been doing TMCC conversions since the days of the LCRU scavenged from Lionel locos (Pre-Digital Dynamics, Pre-TAS, And Pre-ERR) mostly for 5 hobby shops located in a rural not too affluent part of Upstate NY, I will say that while I personally prefer the Cruise Commander; the DC Commander has been the choice of my customers almost 2 to 1 because of the price differential. For them the extra $50 per loco is a lot of money. I'm saying this not to start an argument but merely to offer some info from the other side of the coin (pun intended!). On a more generalized note, if you have shelf queens or conventional engines you have been "meaning to upgrade" but haven't done anything to about them, now is the the time to actually do it this Fall when the new supply of TMCC components becomes available. Without Scott and Lionel coming to an agreement you would be out of luck, so I would not wait any longer to do your upgrades or repairs. Good input, I guess I push the Cruise Commander pretty hard as I know in the overall price it's not that much more for a significant performance gain. And a really good one too! Once I'm sure I can get more upgrade products (and others can too), I'll crank out another run. I have the "improved" version waiting in the wings, smaller and with a couple new features. That will be the one that gets produced. Good advice Ed. I had two more upgrades on my wish list and thought that I missed the boat. I will not delay placing my order. Dollar for dollar and ease of installation make these upgrades great value. Great News! Thank You Scott for taking this financial chance so as to keep this option open to us. I have a couple of engines that need some help and I will be ordering the boards when they become available. One suggestion though, make the directions idiot proof so I can play too. It's hard to make anything foolproof, fools are frequently very ingenious. Remember the old adage: "Put your money where your mouth is"? Well, unless we want to be consigned to the trash heap of Silly Whiners - now is (or soon will be) the time. Postpone purchasing that next used passenger car set and pony up for a couple of upgrade kits. So is this improvement a Supa Chuffa III version or more likely a Supa Chuffa 2.5? Gratitude to both Scott AND Lionel! I'm looking at 4-5 loc conversions in the Fall. Orders will be placed. John: You certainly have a way with words. Another of your quotes I must remember! I reviewed the thread but saw no mention of Atlas O. Scott will you sell boards to them? Lionel clearly has no plan here. They cut out a supplier and created a lot of chaos for their customers. They did this without another option lined up. Then Scott comes in and saves the day. I think they are still working on a Plan B? I say that because Lionel said ERR products were getting out of date. Now I'm supposed to buy them? I'm out. MTH from now on. Loosley modeling Chicago in the 1950’s to 1970’s. I say ... questionable logic there. The earth almost moved off its axis when Microsoft announced a couple years ago that they would no longer support XP. The difference, of course, is that there were other products available at the time to take its place, even though millions of people complained and were perfectly content to just keep their XP. Reading between the lines a little, I think Scott is saying (and Lionel CEO Hitchcock in his statement, as well) that Lionel will have another control system coming down the pike, which will supercede TMCC and be available for installations (and to 3rd Rail and Atlas as well), but that product is still in the development stage. By Jove, I think you've got it! I'll take the "obsolete" boards, thanks. With regards to the DC commanders, while I enjoy the cruise control and like to just let things run sometimes, the DC commander offers one the ability to "drive" the loco from the remote just like under conventional control. Cruise is great with the larger can motors with a flywheel, DC commander works just fine with the smaller axle drive motors. For me it is the consistency in control. I am glad to see these will be returning since my order was cancelled, too late to the party. A mini Commander 2 will work. The MC-II is the only one that fits. Sadly, that's one that isn't currently slated to be picked up in the currently licensing deal. I'm hopeful that maybe in the future it may happen, it all depends on how much volume there would be. I'm glad I stocked up on the MC-II boards before they disappeared as I have a number of projects that I'll need them for. I just wish I had more MC-ACC boards, I didn't plan far enough ahead on those.